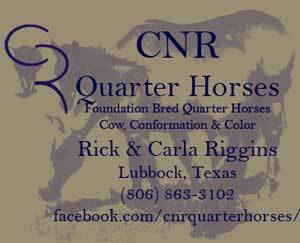 For All Your Promotional Needs ~ The SportZone is where CNR Quarter Horses get all of their promotional and wearable advertising done. They offer custom screen-printing and embroidery with your logo or brand delivered in a timely manner with superior quality and can beat anyone else's price with very small minimums. Hancock Horses is dedicated to providing a complete portal web presence to serve & represent all breeders of this important foundation bloodline whose horses of today are as successful & "modern" as their ancestors were in the founding years. Horses Now ~ Horses for sale and useful horse news and information site. Primarily UK based with UK horses and horseboxes for sale. Got horse news? Send it to us. Quarter Horses Web Ring ~ Designed to showcase the Quarter Horse enthusiasts' Home Pages and Sites on the WWW. by Rick and Carla Riggins.